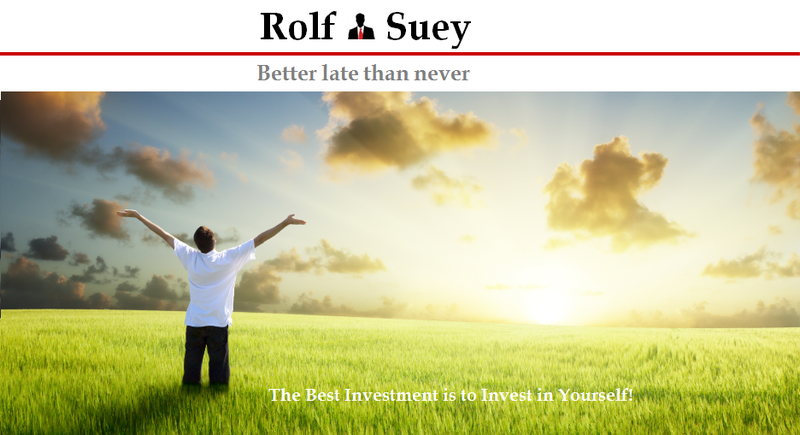 Rolf Suey - Better Late Than Never: Sembcorp Buy or Not? – Ask Who? So much had been discussed lately on Sembcorp lately, be it Sembcorp Industries (SCI) or Sembcorp marine (SCM). 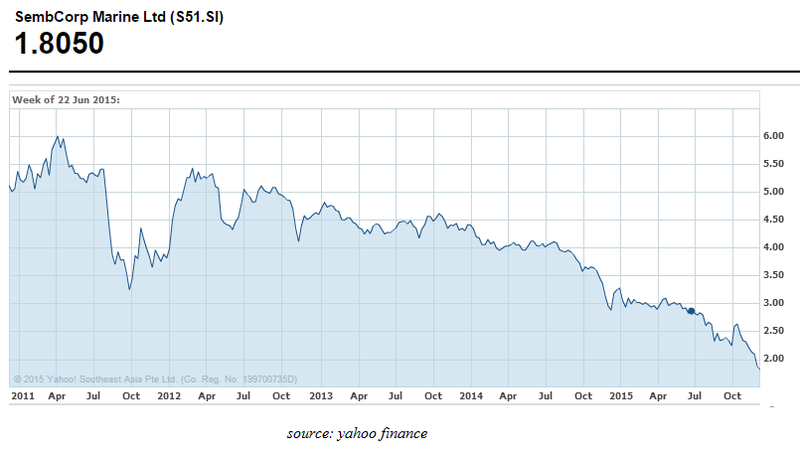 Both SCM and SCI stock prices are at their 5 year low. The price decline is primarily after SCM issue profit warning on 1 Dec for coming quarterly result. This is at the back of one of the worst oil crisis for decades which resulted likely in the lack of new orders, potential terminations and postponements of existing contracts. SCI marine division owns ~61% of SCM. The marine division contributes ~>40% of SCI bottom line in 2014. If SCMis to suffer in profit, so will SCI then. To buffer the bad news from rigs cancellation from Marco polo and postponement from North Alantic Drilling, SCI had announced a couple of good news thereafter also. SCI utility segment has signed an MOA to invest and develop a US$300mil gas-fired power plant in Myanmar and the completion of Fujairah Water and Power Plant in the UAE. Marine segment is also not all bad, with LNG dominating the headlines, after SCM announced record number of LNG repairs and upgrade over the years. So when a Temasek-owned Blue chip which had such impressive results over the years has her share price start to tumble, investors' hands will start to get itchy. And ready to hit the buy button anytime? 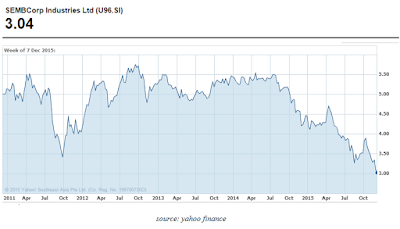 Investors then asked - Is SCI or SCM cheap enough to buy or nimble? Whether to buy or not, many will turn to indicators such as the oil price outlook or all the various analysis to get the so called intrinsic value. But can my question is are all these checks important when a company is inherent cyclical and largely dependent on oil price? 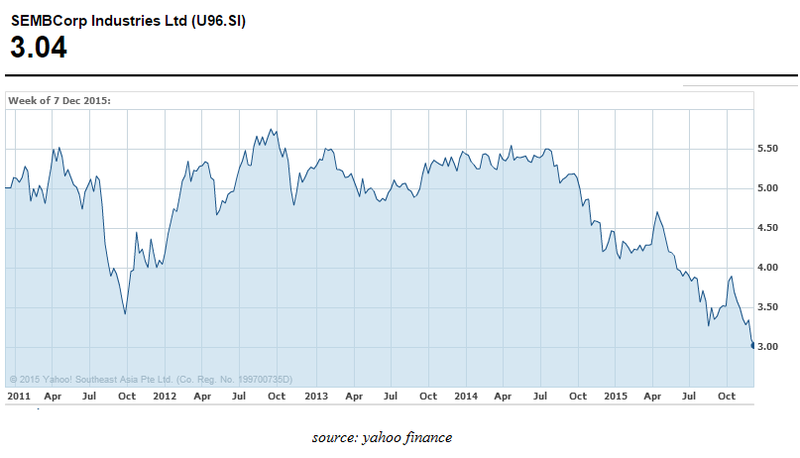 It's obvious that SCM's plunged in share price/ profits is related to the plummet of oil price. Can you then predict the oil price? If not, how can you predict the earnings of SCM/SCI? Perhaps the biggest reason to buy or not has more to do with yourself rather than the price now or the oil price forecast. How long I intend to hold? Worst case scenario! am I able to take another 40% drop in price and sleep well? What if oil price tumble to $20-25 pb? What is my target sell price, if ever I am going to sell? Be very sure that this is under speculative stock buy. For a general guideline, normally it's prudent not to allow your total speculative stock be more than 5-10% of your total portfolio! Forget the hyped about the stock. Is there better buy elsewhere? Remember: The biggest enemy is often yourself and not the forward outlook. Earlier in Aug, I also blogged about why I am selling SCI at a hefty loss, although the price now is even lower. Refer here for the article. Keppel Corp – How Much Do You Know About Her O&M Businesses? Helix Energy and Sembcorp Marine’s subsidiary Jurong Shipyard have agreed to postpone the delivery of Helix’s newbuild semi-submersible vessel, originally scheduled for delivery in mid-2016. The two companies entered into a second amendment of a construction contract, dated September 2013, for the construction of Helix’s Q7000, which is a newbuild semi-submersible well intervention vessel. The second amendment delays scheduled delivery of the Q7000 from July 30, 2017 to December 31, 2017. In addition, Helix Q7000 has options to extend the scheduled delivery until as late as December 30, 2018. According to Helix’s SEC filing, the company paid 20% of the contract price upon the execution of the contract in September 2013. Prior to the second amendment, the remaining 80% of the contract price was to be paid in two installments, with 20% on June 25, 2016, and 60% upon delivery of the vessel, which was scheduled for July 2017. According to the second amendment, the remaining 80% will now be paid in three installments, with 20% on June 25, 2016, 20% upon issuance of the completion certificate, which is to be issued on or before December 31, 2017, and 40% upon delivery of the vessel. In addition, Helix will pay $28,438 per day for incremental reimbursements to Jurong Shipyard for the period beginning the day after the earlier of the issuance of the completion certificate and December 31, 2017, and ending upon delivery of the vessel and Jurong Shipyard’s reasonable costs arising out of or in relation to the deferment of the delivery that are directly attributable to Jurong Shipyard’s maintenance or construction of the vessel. The vessel was jointly developed by Sembcorp Marine Technology Pte Ltd, a Research & Development subsidiary of Sembcorp Marine, and Helix. It is a purpose-designed platform with capabilities to perform tasks, including conventional and extended top hole drilling, subsea construction, decommissioning well intervention, coiled tubing operations and twin ROV deployment. This is a good way of settlement rather than outright cancellation. If there are no jobs in the market, there are no jobs. Does not do good if SembMarine force the owner to take delivery. SCM still bleed, but at least the wound now bleed slower and there is a chance of recovery! You can see the difference between speculative owner like "Marco Polo" and a true owner like Helix. Helix which is part of Shell will still have a long term relationships with SCM unlike speculator asset owner which is one off! what is the definition of hefty loss, 10%? Are you buying back SCI or giving it a miss? If I buy back cheaper, it justifies my sell earlier! Definitely worth considering, and it is also one of the reasons why I bite my teeth and sell. The question is if "Now" is the right time! Being in the industry, the worst for marine is yet to come! Not sure about how well SCI utilities will do to buffer? The simple truth for marine is large oversupply of vessels and no demand bcos of no new investments from oil co. And next yr, u can see all the backlog orders drying. Everyone is betting the turn around after 2017/2018! Let's see if there will be a miracle in oil turnaround!!! I hope so, but nobody can forecast oil price. Hence its better to prepare for the worst than to gamble its possibility. No change in trend detectable, then no buy for me. I wait. Hi Andy, maybe trending down? Just look at OPEC meeting that was just over. Pessimistic! Such a great educational information its great helped him to complete my project thanks for share it case study report format .